The landmark Adventist Health Study-2 has revealed new discoveries about vegetarian diets. Today’s Dietitian reports from the International Congress on Vegetarian Nutrition with this study’s results. Perched on a foothill in San Bernardino, California—about 60 miles east of Los Angeles—the ivory buildings of Loma Linda University shine like a modern-day beacon. Loma Linda, which means “beautiful hill” in Spanish, is the home of the university and its medical center, which made international headlines in the 1980s when a surgeon at the hospital placed a baboon heart in the chest of “Baby Fae,” marking the dawn of infant heart transplants. Today, Loma Linda is better known for headlines about the community’s longevity. The city was featured in National Geographic as one of the three places in the world with the highest longevity,1 and Dan Buettner lists it as a “blue zone,” a location where people live longer lives, according to his book The Blue Zones: Lessons for Living Longer From People Who’ve Lived the Longest. The news on Loma Linda residents’ long life span is a product of the university’s research on Seventh-day Adventists. Considering that the university is a Seventh-day Adventist health sciences institution, a large number of people in the city practice this faith. One of the main characteristics of Seventh-day Adventists is their healthful lifestyle practices, including discouraging cigarette smoking and drinking alcohol as well as avoiding pork, lamb, shellfish, coffee, and tea. In fact, as many as 35% of Adventists are vegetarian, and Loma Linda University is one of the few “meat-free zones” in the country. “The medical center does serve beef and chicken to patients that request it, but the cafeterias for students, employees, and patients’ families serve no meat,” says Georgia Hodgkin, EdD, RD, FADA, a professor in and the associate chair of the university’s School of Allied Health Professions. Due to these lifestyle characteristics, the Seventh-day Adventist population has been the subject of interest among epidemiologists for more than 50 years. Their observed lower risk of heart disease, cancers, high blood pressure, and arthritis drew speculation that their lifestyle—particularly related to their diet—may significantly affect health outcomes. The absence of certain lifestyle factors among Adventists, such as smoking and drinking, make other dietary factors easier to observe in research. In addition, the wide range of diets among this group, from strict vegetarian to a typical American diet, allows for researchers to investigate how various dietary patterns influence health outcomes. Gary Fraser, PhD, MPH, led the AHS-2 research team and spoke on the study’s findings—both published and unpublished—at the International Congress on Vegetarian Nutrition, held at Loma Linda University in February. “For many years, researchers were convinced that kinds of vegetarian diets were responsible for only moderate differences in results, but there was inadequate research on vegetarian diets,” he explained. However, the AHS-2 revealed a range of benefits along the spectrum of vegetarian diets. • Soy protein and plant protein intake was much greater in vegans than in nonvegetarians. • While the omega-3 fatty acids EPA and DHA were much lower among vegans and vegetarians, the plant omega-3 fatty acid alpha-linolenic acid was higher in this group (about 2 g/day), and higher levels of EPA and DHA were found in adipose tissue. • Saturated fat intake was very low in vegans. • Beta-carotene and vitamin C intake was much higher in vegans. 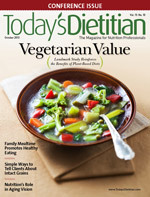 • Vegans and vegetarians take supplements much less than nonvegetarians. • Vitamin B12 intake in vegans is low, but they often supplement this nutrient. • Total iron intake is good for vegans, but it has the potential to be slightly low because typically they’re not supplementing this nutrient. • Total calcium intake is considerably low in vegans but not in vegetarians. • BMI: The data showed a progressive weight increase from a vegan diet toward a nonvegetarian diet. “The most striking features of the data are the great range of BMIs: The average for vegans was 23.6; lacto-ovo vegetarians, 25.7; pesco-vegetarians, 26.3; semivegetarians, 27.3; and nonvegetarians, 28.8,” he noted. • Cardiovascular disease (CVD) risk factors: The same trend was observed for cardiovascular disease markers, such as levels of cholesterol, diabetes, high blood pressure, and metabolic syndrome, with the vegan dietary pattern demonstrating the lowest risk compared with the nonvegetarian pattern. “Regarding prevalence of hypertension, we saw large differences in the spectrum of diets between vegans through nonvegetarians. In total, the findings show a great deal of evidence for many CVD risk factors, showing that a vegetarian diet—in particular a vegan diet—is beneficial,” Fraser said. However, he reported that there was an interesting finding with other markers of immune function, showing that insulinlike growth factor 1 and 3 weren’t different between vegans and nonvegetarians, which indicated “there’s work to be done here,” according to Fraser. • Cancer: Benefits also were seen for cancer risk, according to Fraser, who reported that “we’re not ready to talk about individual cancers; in about a year we will publish our first paper on specific cancer risk. For overall cancer, we found that all vegetarians had an 8% reduction in risk, and vegans did best of all. Fraser summarized that the vegan diet may decrease the incidence of all cancer combined, especially regarding the risk of female-specific cancers. • Sustainability: Joan Sabaté, MD, DrPh, chair of nutrition at Loma Linda University’s School of Public Health, who also spoke at the International Congress on Vegetarian Nutrition, reported that vegetarian diets are more sustainable. According to a life-cycle assessment applied to the AHS-2 data, Sabaté reported that the greenhouse gas emissions for a vegan diet were 41.7% lower compared with a nonvegetarian diet, with a lacto-ovo vegetarian diet being 27.8% lower, a pescatarian diet 23.8% lower, and a semivegetarian diet less than 20% lower. More information on the health benefits of vegetarian diets likely is forthcoming from continuing AHS-2 data. According to Loma Linda University, the study could continue for another 15 to 20 years, given adequate funding. Additional questions will be addressed during the analysis of AHS-2 data, including which foods enhance quality of life, whether soyfoods can help with breast and prostate cancer prevention, whether heredity or lifestyle play a more important role in health than diet, and which foods help prevent cancer, diabetes, heart disease, Alzheimer’s disease, and arthritis. — Sharon Palmer, RD, is a Los Angeles-based foodie, the author of The Plant-Powered Diet, the editor of the Environmental Nutrition newsletter, and a contributing editor of Today’s Dietitian. 1. Buettner D. The secrets of long life. National Geographic website. http://ngm.nationalgeographic.com/ngm/0511/feature1. May 2011. Accessed May 20, 2013. 2. History of Adventist Health Studies. Loma Linda University School of Public Health website. http://www.llu.edu/public-health/health/history.page. Accessed May 20, 2013. 3. About Adventist Health Study-2. Loma Linda University School of Public Health website. http://www.llu.edu/public-health/health/about.page?. Accessed May 20, 2013. 4. Adventist Health Study-2: early findings. Loma Linda University School of Public Health. http://www.llu.edu/public-health/health/early_findings.page. Accessed May 20, 2013. 5. Rizzo NS, Sabaté J, Jaceldo-Siegl K, Fraser GE. Vegetarian dietary patterns are associated with a lower risk of metabolic syndrome: the Adventist Health Study 2. Diabetes Care. 2011;34(5):1225-1227. 7. Orlich MJ, Singh PN, Sabaté J, et al. Vegetarian dietary patterns and mortality in Adventist Health Study 2. JAMA Intern Med. 2013;173(13):1230-1238. 8. Lifestyle, diet and disease. Loma Linda University School of Public Health website. http://www.llu.edu/public-health/health/lifestyle_disease.page. Accessed May 20, 2013.